The BEST Epoxy Repair Kit can be used to repair lifted pads and traces as well as build up and repair edge corner damage to PCB’s. BEST epoxy repair kits are designed by artisans who have been repairing circuit boards for many years; therefore the right tools have been included in this general epoxy repair kit. 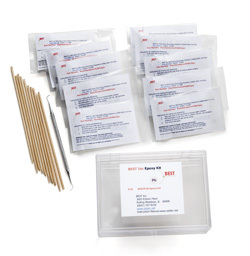 This kit includes (10) 2 gm packs of resin/hardner, orangewood sticks are included to assist with forming and bending traces for easy placement, and a stainless steel dental pick. The resin/hardner is pre-measured to ensure every handler will achieve optimum results.